Ιn ancient times the ‘keeper of the winds’ was Aeolus, made famous in Homer’s Odyssey. He was often associated with the four wind gods - the children of Astraeus, the Titan astrological deity of the dusk, and the Titan goddess of the dawn, Eos - also known as Aurora. These four wind gods were called the Anemi and were named after the 4 cardinal points of the compass. Their legacy echoes through to modern times in language and mythology. Millennia later Anemi is the word for winds in Greek and the names of the directional winds in Greece still bear resemblance to these ancient wind deities. When planning a sailing trip in Greece, novice or old hand, knowing about the wind is an obvious advantage. Of the four chief Anemi, Boreas was the god of the North wind and bringer of cold winter air, Zephyrus was the god of the West wind and bringer of light spring and early-summer breezes, and Notus was the god of the South wind and bringer of the storms of late summer and autumn; Eurus, was the god of the East wind. Of the four chief Anemi, Boreas was the North wind coming down from Siberia and bringer of cold winter air and turbulence. Unless, you are sailing in winter in Greece you are unlikely to meet this wind. Of most interest to leisure sailors in Greece is the seasonal, topical Etesian wind referred to in Greece mostly by the Turkish word ‘meltemi’. The meltemi blows all summer in Greece in the Aegean Sea, originating in the North Aegean and gathering strength as it moves south. It blows in a northeasterly to northerly direction in the summer months, especially July and August and provides a good, steady sailing wind and respite from the summer heat. Strongest in the afternoon, the meltemi often dies down in the evening. Sometimes, it can blow for days uninterrupted at Force 7-8. At this strength, some yachts and most island ferries cannot sail. Sailing in the Cyclades in summer, the meltemi can be very strong. Known as the windy isles, the Cyclades are recommended for experienced sailors or skippered charters. Also, in the wide corridor between the Dodecanese and Cyclades it blows undisturbed over 100 miles of open sea. The waves can reach heights over three meters within hours and the currents in the area make these waves steeper and can be extremely dangerous for boats smaller than 10 metres. The Ionian Sea in the west of Greece is not affected by these Etesian winds but experiences a reliable Maestro wind throughout the sailing season. Blowing from the North-west in summer in the Ionian and the Adriatic when pressure is low over the Balkan Peninsula, the Maestro is a fresh breeze accompanied by fine weather and light clouds and a friendly wind for sailors in the area. Sailing around the Ionian Islands is therefore known as ideal and good for beginner sailing. Ionian gales are not unknown, but they are well forecast and do not last that long. Zephyrus was the god of the West wind and bringer of light spring and early-summer breezes. A pleasant wind, beneficial for vegetation, without much danger for sailors. In fact it is said that the wind god Zephyrus abducted the goddess Chloris and gave her dominion over flowers. Any gentle breeze nowadays is referred to as a zephyr. In Greek mythology, Eurus, the East wind, was the only wind not associated with any of the three ancient Greek seasons. Throughout mythology, religious texts and literature, the east wind has often heralded unfavourable events or mischief. In Greece he mostly makes his presence felt in partnership with the South and North winds. True south winds are dangerous in Greece, as most of the harbours are set up to be protected from the summer Etesian winds. They usually only blow in winter and you should rely on local knowledge for this event. Wind blowing from the South-east, also known as Sirocco, may blow during April to October, but is more frequent during April/May and September/October. This wind can get quite strong a few times a year and can last for up to 2 days. Your boat will be exposed in most ports, unless the locals specifically recommend the place for south winds. This Anemi comes from the Sahara and picks up dust as it blows northward over North Africa. The dust is carried offshore and can cause a reduction in visibility in the far South of Greece. Sirocco winds carry warm, humid air northward across Italy and the Balkan Peninsula, creating an environment favourable for thunderstorms, especially during the spring. Once it hits the mountains, this air rises quickly over the higher terrain, increasing the chances of thunderstorm. Sometimes this results in severe storms, heavy rainfall, and flooding. The Sirocco's lasts from half a day or it might last several days. Wind speeds of up to 54knots are most common during autumn and spring, reaching a peak in March and in November. For sailors the only thing to do is batten down the hatches, sit it out in port and be ready to clean your boat when it blows over. 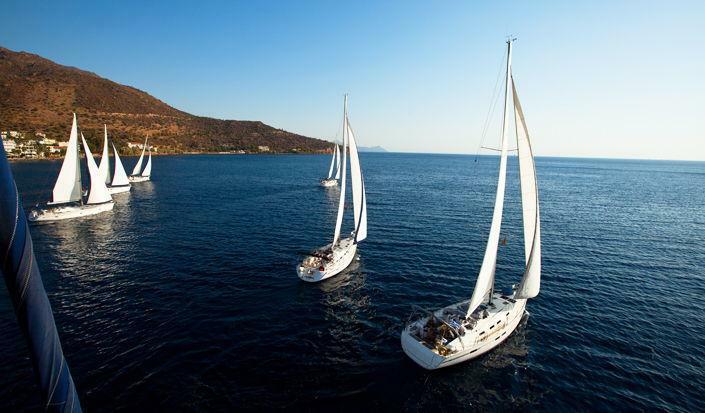 Whichever season you decide to sail in Greece- may the winds be with you!